Today I found out It’s a Wonderful Life was based on a “Christmas Card” short story by Philip Van Doren Stern, which was originally sent out to around 200 of Stern’s friends and family in December of 1943. The short story was called The Greatest Gift and was inspired by a dream Stern had one night in the 1930s. Stern, already an accomplished author at this point, albeit a historical author, then proceeded to write the 4,000 word short story about a man named George who was going to commit suicide by jumping off a bridge, but was stopped when someone happened by and struck up a conversation with him. The mysterious person eventually learns that George wishes he’d never been born and grants George his wish. George soon discovers that no one he knows recognizes him and that many of the people he’d known were worse off in their lives because he had never existed. Most prominent among these was his little brother who had drowned because he had not been there to save him. George eventually gets the stranger to change everything back to the way it was and is now glad to be alive. Stern initially sought to find a publisher for his short, 21 page story, but failed in this endeavor, so decided to make a “Christmas Card” style gift out of it and printed 200 copies which he sent out to friends and family in December of 1943. This ended up being a gift that gave back, as the work eventually found its way into the hands of producer David Hempstead who worked for RKO Pictures. RKO pictures then paid Stern $10,000 (around $124,000 today) for the motion picture rights to the story, just four months after Stern had sent it out. Various adaptations were then written before the screenplay version of the story was sold to Frank Capra’s production company in 1945, also for $10,000. Capra’s company subsequently adapted the story further and ultimately made it into It’s a Wonderful Life, which debuted in 1946. Interestingly while the story was based on The Greatest Gift, the character of George Bailey was actually based partly on the founder of Bank of America, A.P. Giannini. Giannini was also the inspiration for a similar character in Capra’s American Madness. At the age of 14, Giannini left school and began working with his step father, Lorenzo Scatena, in the produce industry as a produce broker. By the time he was 31, he was able to sell much of his interest in this company to his employees and had planned to retire. However, one year later, he was asked to join the Columbus Savings & Loan Society, which was a small bank in North Beach, California. Once he joined up, he found that almost nobody at the Savings & Loan, nor other banks, were willing to give loans to anyone but the rich or those owning businesses. At first, Giannini attempted to convince the other directors at the Savings & Loan to start lending to working class citizens, to give them home and auto loans, among other things. He felt that working class citizens, though lacking in assets to guarantee the loan against, were generally honest and would pay back their loans when they could. Further, by loaning them money, it would allow working class citizens to better themselves in ways they would not have been able to do without the money lent to them, such as being able to buy a home or to start a new business. He was never able to convince the other directors to begin lending to the working class. So he raised funds to start his own bank, the Bank of Italy, which later became the Bank of America. He then made a practice of not offering loans based on how much money or equity a person had, but based primarily on how he judged their character. Within a year, Bank of Italy had over $700,000 in deposits from these working class individuals, which is somewhere around $15-$20 million today. By the middle of the 1920s, it had become the third largest bank in the United States. The Greatest Gift was eventually made into an actual published work in 1944, one year after Stern had sent it out as a Christmas present, being published in Reader’s Scope magazine. One month later, it was also published in Good Housekeeping under the title “The Man Who Was Never Born”. Stern also managed to get it published in book form around this time, with illustrations for the story done by Rafaello Busoni. When the motion picture rights of the story were first sold to RKO, Cary Grant had been slated to play the lead role of George. When Capra acquired the rights, Lionel Barrymore ended up being the one to convince Jimmy Stewart to take the part, even though he initially didn’t want it, as it was too soon after he had returned from WWII. Jimmy Stewart rose to as high as a Two Star General in the U.S. military. In August of 1943, he found himself with the 703rd Bombardment Squadron, initially as a first officer, and shortly thereafter as a Captain. During combat operations over Germany, Stewart found himself promoted to the rank of Major. Stewart participated in several counted and uncounted missions (on his orders) into Nazi occupied Europe, flying his B-24 in the lead position of his group in order to inspire his troops. For his bravery during these missions, he twice received the Distinguished Flying Cross; three times received the Air Medal; and once received the Croix de Guerre from France. This latter medal was an award given by France and Belgium to individuals allied with themselves who distinguished themselves with acts of heroism. By July of 1944, Stewart was promoted chief of staff of the 2nd Combat Bombardment wing of the Eighth Air Force. Shortly thereafter, he was promoted to the rank of colonel, becoming one of only a handful of American soldiers to ever rise from private to colonel within a four year span. After the war, Stewart was an active part of the United States Air Force Reserve, serving as the Reserve commander of Dobbins Air Reserve Base. On July 24, 1959, he attained the rank of brigadier general (one star general). He finally retired from the Air Force on May 31, 1968 after 27 years of service and was subsequently promoted to Major General (two star general). It’s a Wonderful Life was the first film Jimmy Stewart did after serving in WWII. It came at a time when he was strongly considering quitting acting, as he didn’t know if he’d be able to continue after his experiences in the war. On January 5, 1992, It’s a Wonderful Life became the first American program ever to be broadcast on Russian television. A translated version, courtesy of Stewart and Lomonosov Moscow State University, was broadcast to over 200 million Russians on that day. 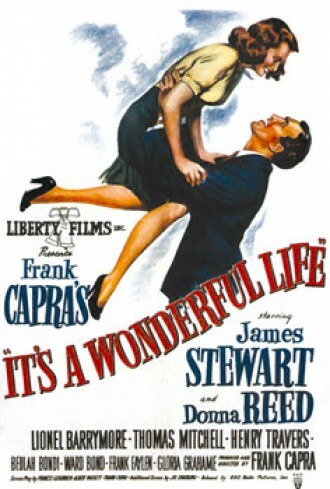 It’s a Wonderful Life was largely considered a flop after it was released and, partially due to this film’s poor showing at the box office, Capra’s production company went bankrupt and Stewart began to further doubt his ability to act following the war. However, thanks to being considered a Christmas movie (which Capra himself claimed to be a surprise to him, as he didn’t see it that way), the movie steadily gained momentum over the years and today is considered one of the great classics in movie history. Stewart himself stated that It’s a Wonderful Life became his favorite of all the movies he had done in his career. It’s a Wonderful Life cost $3.7 million to make (about $44 million today) and only took in $3.3 million in its initial run in theaters. This made it good enough for only the 26th best (out of 400+) gross take of American movies in 1947. Incidentally, it did beat out Miracle on 34th Street in 1947 for gross revenue, being one position ahead of it. While initially a flop with the public, It’s a Wonderful Life was nominated for five academy awards, though didn’t win any. Today, it is considered by the American Film Institute as one of the 100 greatest American films ever made. They also have it as the number one most inspirational American film of all time. In the scene in It’s a Wonderful Life where “Uncle Billy” is drunk and leaving the party at George’s house, the sound of him apparently running into some garbage cans and falling down is heard. In actuality, one of the crew members accidentally dropped some equipment after Uncle Billy walked out of the shot. Rather than break character, the actor who played Uncle Billy, Thomas Mitchell, shouted “I’m all right, I’m all right!” and Jimmy Stewart also played along. The take was obviously the one that made it into the movie, despite the gaff. The stagehand that dropped the equipment was given a $10 bonus. Donna Reed grew up on a farm and, on a bet from Lionel Barrymore, demonstrated how to milk a cow on the set of It’s a Wonderful Life. Over his lifetime Philip Van Doren Stern published over 40 books, mostly historical and many on the Civil War, to which he became one of the nation’s leading scholars.